ReInsuranceMax is an asset management program laser focused on the unique needs of reinsurance companies and their owners. We provide a virtually turnkey program designed to manage and grow the assets in every type of reinsurance program. We carefully balance anticipated claims rates, sales cycles, and other factors, and monitor all of these aspects on an ongoing basis to keep you on track. We start by listening to you. We discuss your investment goals, time horizon, appropriate level of risk, and realistic return expectations for each type of reinsurance program. Then we determine appropriate portfolio allocations for each program. With that in mind, the five categories pictured on the right give a good general idea of the strategies we utilize for these programs. TAX AWARE: We employ tax-aware, tax-efficient strategies designed to minimize the effects of taxes wherever possible to maximize your ultimate, bottom-line results. INSTITUTIONAL MANAGEMENT: Our Institutional Management gives you privileged access to the same world class money managers who serve large endowments, pensions and institutional portfolios. LOW COST / HIGH IMPACT: ReInsuranceMax portfolios, through relationships with our strategic partners, integrate advanced research, methodical portfolio design and careful execution while balancing risks, costs and other factors. 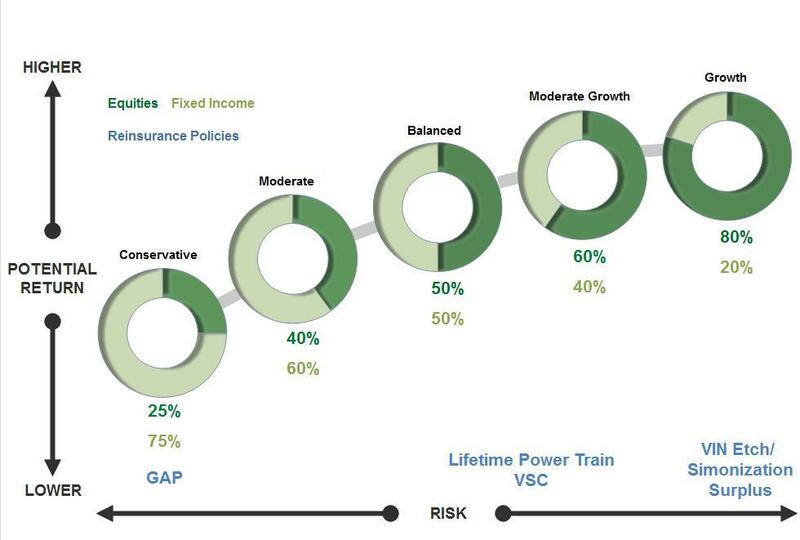 As you move from left to right on the graph - increasing risk - there are model strategies that can offer higher return potential. However, as with any type of portfolio structuring, attempting to reduce risk and increase return could, at certain times, unintentionally reduce returns or increase volatility.